Will Adding My Child to My House Deed Help Avoid Probate? A common estate planning goal for many Florida residents is keeping a home or other real property within the family. There are a number of options to accomplish this objective. You can simply leave the property to a family member in your last will and testament. But this means the home will need to go through Florida probate first, which can take some time. To avoid this, you may wish to consider a non-probate transfer. One thing you could do is simply put your family member’s name on the home as a co-owner. Married couples typically own property as tenants by the entirety or joint tenants with rights of survivorship, which basically means the same thing. In this type of ownership arrangement, when one spouse dies the other automatically becomes full owner of the property. No probate is necessary. But you are free to create a joint tenancy with another relative or individual. Say your adult daughter lives with you and you want to make sure she keeps the house after your death. You could sign a new deed naming her as a joint tenant with right of survivorship. This immediately makes her a co-owner of the property and guarantees her right to assume full ownership without the need for probate. Of course, putting a family member’s name on a deed can have negative consequences later, especially if there is a falling out or circumstances change. Consider this scenario. Your daughter decides to get married and move away. Now you want to leave your home to another child. The problem is, your daughter is still on the deed and you cannot simply remove her unilaterally. You also need to make sure that the deed reflects your actual wishes. The above hypothetical assumes the deed clearly reflects an intention to create a joint tenancy with rights of survivorship. But if the deed is drafted incorrectly, a court may interpret it as creating a tenancy in common. This is a critical distinction. When two or more people own property as tenants in common, they each own a separate share of the property. So when one tenant dies their share may still be subject to probate, while the other party’s separate share is left intact. Instead of adding people to your home’s deed during your lifetime, it may be more sensible to simply place your property into a revocable living trust. 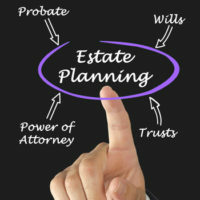 A trust is an estate planning vehicle that you can control during your lifetime as the trustee. When you die, a successor trustee appointed by the trust instrument will dispose of your property as directed. Since property in a trust does not pass under Florida probate law, you can greatly simplify the administration of your estate. And as the trust is “revocable,” you can amend it as often as you need to when family circumstances change. Of course, a trust is not for everyone. Every individual and family’s situation is unique and may benefit from different estate planning options. A qualified Fort Myers estate planning lawyer can review your situation and help select the options that work best for you. Call the Kuhn Law Firm, P.A., at 239-333-4529 today to schedule a free estate planning consultation with a member of our team.